Millions of commuters in London faced rush-hour misery as Tube workers continued a 72-hour walkout over pensions and jobs. The strike by the RMT union, in a row following the collapse of maintenance firm Metronet, has closed two-thirds of the Tube network and affected 10 lines. London Underground managers said services may not return to normal before Friday morning. 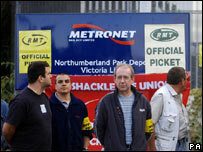 Talks aimed at ending the strike will be held later, the RMT announced. The 10 lines affected by the industrial walk out, which began at 1800 BST on Monday, are the Bakerloo, Central, Victoria, Circle, District, East London, Hammersmith & City, Metropolitan, Waterloo & City and Piccadilly. Only the Jubilee and Northern lines are operating a full service. 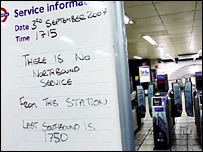 They are maintained by another firm along with the Piccadilly line, which is partly suspended due to the strike. At Victoria station metal gates blocked the entrance to the Tube, and posters informed passengers that the Victoria, District and Circle lines were closed. Long queues built up at the stands and some people were forced to let two full buses go past before they could get a seat. Adrian Wells, 57, an accountant from Sutton, Surrey, said: "I've had to get three trains and two buses this morning to get to work - it's ludicrous, I'm already tired. Great, now my commute is not only longer and more crammed but even more unreliable. "I'm not surprised at this strike - they're such a militant union, it's what you'd expect." He added: "I suppose I might understand if they were doing this because something had been imposed on them but this is about taking pre-emptive action, which ultimately is mucking up people's lives across London." Unions have been seeking guarantees there will be no job losses, forced transfers or cuts in pensions as a result of Metronet's collapse in July, when it went into administration. A spokesman for Transport for London (TfL) said: "The disruption across the network last night was severe and totally unacceptable. "We share Londoners' view that this disruption is intolerable, as it serves no purpose." He added: "The RMT have been given cast iron guarantees that no staff will lose jobs, pensions or be transferred as a result of Metronet's collapse. "The other unions have accepted these guarantees. The RMT have ignored them, harming Londoners and their union." 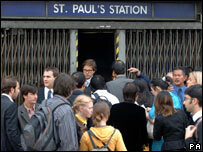 The strike went ahead despite appeals by Mayor of London Ken Livingstone, who branded it one of the most "purposeless" ever called. Two other unions, Unite and the TSSA, decided not to walk out after being given assurances. But the TSSA said its 360 members would take part in a second 72-hour stoppage planned for next Monday if a matter concerning pensions was not resolved. RMT general secretary Bob Crow said he had received only "qualified assurances" covering the period of administration. A TfL spokesman said all three Tube unions had received all the assurances they were seeking. TfL released a letter it sent to Mr Crow which outlines those promises. Striking RMT members will lobby the Department for Transport on Tuesday as part of the union's campaign for Tube maintenance work to be brought back in house. Union leaders call off another three-day strike on the Tube.